The Moscow times reported last week that three Russian metals companies hope to announce a major investment worth more than $2 billion in Zambia next month, according to Russian diplomats. Well, not according to Mineweb. Apparently our Russian friends are used to making grand claims that never materialise. Technically we can't call them infestors, but much more like impostors. It is unfortunate that the Zambian government has found it necessary to establish additional diplomatic missions at a time when so many of our fellow citizens are wallowing in abject poverty. What is prompting us to make such irresponsible decisions? How can this be when the basic needs of education, public health, agriculture, road works and bridges, public safety and security, civil servants and civil service retirees, and orphaned and vulnerable children (OVC)? If we have surplus funds in public coffers, let us use them in addressing these needs first. We should not forget that meaningful levels of foreign direct investment (FDI), tourism, and all the other benefits we seek through trade and political relations with other countries will not be realized if we fail to address these needs. For example, failure to address the rampant incidence of crime and corruption will fan away investors and tourists, as well as prompt governments worldwide to warn their citizens against coming to our country. We, therefore, need to get our national priorities right, and we need to do so now rather than later! After all, of what value is a government if it is not perpetually responsive to the basic needs and aspirations of the masses, and of what use is leadership if it cannot be a means to the serving of one’s fellow citizens? What we actually need now is to reduce the number of our beloved country’s embassies in order to save some money for allocation to poverty reduction. Governments worldwide that have a genuine desire to develop mutually beneficial relations with us will understand our reason for doing so. Suggestively, let us reduce the 29 or so existing Zambian diplomatic missions abroad by half by creating foreign missions that would serve groups of countries rather than single countries. 1. Strive to educate other countries about our beautiful country and its lovely and peace-loving people. If we fail in this endeavor, other countries will not readily engage in political, cultural and economic relations with us. 2. Maintain up-to-date profiles of foreign countries in order to continually fine-tune Zambia’s relations with the rest of the world, and to furnish Zambian travelers with useful information about foreign countries to enhance their safety and/or business pursuits abroad. 3. Redress travelers’ frustrations caused by inadequacies in the processing of passports and visas by streamlining bureaucratic procedures and occasionally re-training consular personnel. 4. Encourage each and every Zambian traveler to foreign countries to consider themselves as dependable ambassadors of our Motherland, and to conduct themselves in a civilized and lawful manner. 5. Grant special Zambian residency to foreign nationals who would be adjudged to have made exemplary contributions to the promotion—in their own countries and/or beyond—of peace, freedom, justice, democracy, prosperity, philanthropy / altruism, poverty reduction, and other noble causes and endeavors. And to make it possible for such foreign nationals and/or their immediate or bereaved families to visit Zambia whenever they feel like and enjoy the beauty, warmth, friendliness, and rich cultures and traditions of our beloved country and its people. A provisional list of such people and/or their families would need to include the following: Mr. Kofi Annan, U2’s Bono, Mr. Jimmy Carter, Mr. Jimmy Cliff, Mr. Bill Clinton, the late Mr. Mahatma Gandhi, the late Dr. John Garang, Mr. Mikael Gorbachov, Ms. Angeli-na Jolie, Senator Edward Kennedy, the late Dr. Martin Luther King, Jr., the late Mother Teresa, the late Mr. Samora Machel, Mr. Nelson Mandela, Mr. Mahathir Mohamad, the late Mr. Joshua Nkomo, Bishop Desmond Tutu, Ms. Oprah Winfrey, Mrs. Anita Roddick, and Ms. Clare Short. The idea of having diplomatic missions in countries which meet the following suggested criteria is a noble one: major trading partners, have more than average of Zambian diaspora living there, large contributors of aid (or development partners), and/or HQs of important international organizations. Along this line of thinking, I have suggested below the reduction of Zambian foreign missions from the current 29 to 22. The countries in parenthesis represent the locations of Zambian missions for regions / clusters of nations. Benin, Burkina Faso, Cape Verde, Côte d’Ivoire, The Gambia, Ghana, Guinea, Guinea-Bissau, Liberia, Mali, Mauritania, Niger, [Nigeria], Senegal, Sierra Leone, and Togo. Algeria, Egypt, [Libya], Mauritania, Morocco, Sudan, Tunisia, and Western Sahara. Angola, Botswana, Lesotho, Madagascar, Mauritius, Mozambique, Namibia, [South Africa], Swaziland, and Zimbabwe. Burundi, Cameroon, Central African Republic, Chad, [Democratic Republic of the Congo], Equatorial Guinea, Gabon, Republic of the Congo, Rwanda, and São Tomé and Príncipe. Burundi, Comoros, Djibouti, Eritrea, Ethiopia, Kenya, Malawi, Rwanda, Seychelles, Somalia, [Tanzania], and Uganda. Belize, Costa Rica, El Salvador, Guatemala, Honduras, Nicaragua, and Panama. [Canada—CIDA], Mexico and [United States—USAID]. Argentina, Bolivia, Brazil, Chile, Colombia, Ecuador, French Guiana, Guyana, Paraguay, Peru, Suriname, Uruguay, and Venezuela. Afghanistan, Armenia, Azerbaijan, Bahrain, Bangladesh, Bhutan, Brunei, Cambodia, [China + Taiwan], Cyprus, Georgia, [India], Indonesia, Iran, Iraq, Israel, [Japan], Jordan, Korea, Kuwait, Kyrgyzstan, Laos, Lebanon, Malaysia, Maldives, Mongolia, Myanmar, Nepal, North Korea, Oman, Pakistan, Philippines, Qatar, Saudi Arabia, Singapore, South Korea, Sri Lanka, Syria, Taiwan, Tajikistan, Thailand, Turkey, Turkmenistan, United Arab Emirates, Uzbekistan, Vietnam, West Bengal, and Yemen. Antigua and Barbuda, Aruba, Bahamas, Barbados, Cayman Islands, [Cuba], Dominica, Dominican Republic, Grenada, Guadeloupe, Haiti, Jamaica, Martinique, Puerto Rico, St. Kitts and Nevis, St. Lucia, St. Vincent and the Grenadines, Trinidad and Tobago, Turks and Caicos Islands, and Virgin Islands. Albania, Andorra, Armenia, Austria, Azerbaijan, Belarus, Belgium, Bosnia and Herzegovina, Bulgaria, Croatia, Cyprus, Czech Republic, [Denmark], Estonia, [Finland], France, Georgia, [Germany], Greece, Hungary, Iceland, Ireland, Italy, Kazakhstan, Latvia, Liechtenstein, Lithuania, Luxembourg, Republic of Macedonia, Malta, Moldova, Monaco, Montenegro, [Netherlands], [Norway], Poland, Portugal, Romania, Russia, San Marino, Serbia, Slovakia, Slovenia, Spain, [Sweden—SIDA], Switzerland, Turkey, Ukraine, [United Kingdom—DFID], and Vatican City. [Australia], Christmas Island, Cocos (Keeling) Islands, New Zealand, and Norfolk Island. East Timor (Timor-Leste), Fiji, Maluku Islands, New Caledonia, Papua New Guinea, Solomon Islands, and Vanuatu. Federated States of Micronesia, Guam, Kiribati, Marshall Islands, Nauru, Northern Mariana Islands, and Palau. American Samoa, Cook Islands, French Polynesia, Niue, Pitcairn, Samoa, Tokelau, Tonga, Tuvalu, Wallis and Futuna, and Western Samoa. New York, USA: Permanent Mission to the UN. Geneva, Switzerland: Permanent Mission to the UN. Brussels, Belgium: European Union (EU) Headquarters. A few weeks ago, the Citizenship Committee of the National Constitutional Conference (NCC) unanimously resolved to recommend to include dual citizenship in the Zambian constitution. The resolution provoked mixed reactions from the Zambian public. Some prominent Zambians, such as former republican vice-president Christon Tembo and chief immigration officer Ndiyoyi Mutiti opposed the recommendation on grounds of national security. For Christon Tembo, dual citizenship would compromise national security as those involved may have problems of conflicting allegiances, while Ndiyoyi Mutiti argued that dual citizenship will increase crime as criminals will easily run away to another country for safety. Proponents of dual citizenship, who include former chief justice Mathew Ngulube, argue that it is desirable given globalisation, the increase in cross-national marriages and the inevitable migration to other countries in search of better economic opportunities. There are also those who argue that there are many Zambians who have had to give up their citizenship of the country of birth for economic reasons and which becomes a disincentive for them to invest and have closer links with their home country. Further, the children born of Zambian parents abroad who automatically acquire citizenship by birth tend to lose out the benefits of belonging to the country of their parents. There is also the difficult choice of having to choose between the nationality of one of the parents in the case of having parents with two different nationalities. To be sure, dual citizenship presupposes the possession of two citizenships at the same time. Today, the combination of certain citizenship laws automatically allows certain individuals to acquire two nationalities at the same time. Dual citizenship is a growing phenomenon in today's increasingly global community. While many countries have historically been opposed to dual citizenship status, dual citizenship has grown more common in the last thirty years. One of the main reasons for this proliferation is that new technologies have helped to dramatically increase travel, communication, and international commerce. The opposition to the notion of dual citizenship is informed by a less appreciation of the African and Zambian reality. It should be recognised that largely many Africans and even Zambians tend to have multiple identities. They belong to particular tribes/ethnic groups, are members of particular districts and provinces and citizens of a particular country. In cases of cross-ethnic and cross- national marriages, children will tend to have dual identities, of their parents. For example, children from a Lunda and Tonga parents cannot be expected to choose between the identity of one of their parents. They belong to both and often have rights of residence and enjoy all rights of belonging to that social group. They enjoy rights of citizenship from both their father and mothers side. But this is not the case with children born of parents of different nationalities. The child is made to choose the nationality of one of the parents, as the Zambian constitution does not encourage dual citizenship. The current dual citizenship debate in Zambia should be understood within the context of global trends. It should be recognised that in the last fourty years, Zambia has been home to tens of thousands of people from other countries who have come here to work, by virtue of marriage or due to social ties with Zambian nationals. Some of these people have lived in Zambia for most of their lives, but do not want to cut links with their home country. Thus they have remained established residents without citizenship rights. It would be wrong to doubt the patriotism of these men and women, who have made many contributions to the life and economy of this country. There have been many non-Zambians who have made a tremendous contribution to this country in different ways. I do not agree with the argument that dual citizenship necessarily poses a national security problem. If anything, it will only help enhance a sense of belonging on those of our compatriots who have had to make the difficult choice of renouncing the citizenship of their country of birth. The decision by the Citizenship Committee of the NCC is most progressive and deserves our support. It reflects global trends encouraging dual citizenship for economic, social and cultural reasons. I am particularly opposed to a decision to strip a Zambian of his/her citizenship simply because of having acquired the nationality of another country. In my view citizenship rights should be non-negotiable and should be revoked under very exceptional circumstances. This is because one’s nationality forms their primary identity and as such, they should continue to hold it, irrespective of their decision to acquire the citizenship of another country for economic or social reasons. There are at least 40 countries in the world that recognise dual citizenship and nine of them are in Africa. These include, the Australia, India, United States, United Kingdom, Canada, Germany, Israel, Italy, South Africa, Burundi, Mali. There are discussions in Kenya, Ghana, Rwanda and Uganda on dual citizenship. It is now recognised that allowing dual citizenship encourages foreign investment as foreigners are assured of enjoying citizenship rights, while not losing identity of their countries of origin. In some countries, one can be granted citizenship if they come with investment of a certain amount. The success of Australia, Canada and the United States is partly because of the policy of encouraging dual citizenship and flexible nationality laws. There is no doubt that nationals in the diaspora who could have acquired the citizenship of the host country for convenience can also identify more closely with their home country if they do not have to lose their original citizenship. There is evidence that points to the fact that the Philipines and India, among others, have more than a million of their nationals working and living abroad, who transfer millions of dollars to support their families back home and undertake investments. In my view, dual citizenship provides an incentive to identify more closely with the home country. In the case of Zambia, it should be recognised that tens of thousands of our nationals have fled the country for many reasons, which include fear of political persecution, marriage or to seek economic opportunities or a combination of these. It is important that we ascertain the number of Zambians who have left the country in the last twenty years and are living abroad and how many of them have had to renounce their citizenship. Further, it is important to establish the extent of remittances from Zambians living abroad. Politicians have continued to call on Zambians living abroad to return and make a contribution to the Zambian economy. But the problem that has not been addressed is that most of these may have acquired the citizenship of their host countries and may have forfeited their Zambian citizenship rights. I hope the plenary of the NCC will adopt the proposal to introduce dual citizenship in our constitution. We need a constitution which is inclusive and stripping our nationals of their citizenship should not be entertained. Further, we should also encourage other nationals to feel welcome in our country by granting them dual citizenship so that they can develop a sense of belonging. There is simply no evidence to suggest that dual citizenship poses a danger to national security nor increases crime. If this was the case, large and highly developed countries, such as Australia, Canada, United Kingdom and United States would not be promoting such a policy. As a Pan-Africanist who believes in an African identity, I believe that the encouragement of dual citizenship is a progressive idea which will provide the building blocks to the transition to a common African citizenship. Those opposed to dual citizenship may have difficulties accepting the notion of African citizenship. But they should be reminded that the African Union is moving towards political union, which will include not only the removal of visa restrictions, but the creation of a United States of Africa with a common African passport. We need citizenship and nationality laws that are more inclusive and take account of Zambia’s historical, social and cultural heritage on one hand and the dynamics of globalisation on the other hand. Dual citizenship should be an unobjectionable and unstoppable phenomenon given our multiple identities and we should reflect that in our national law. We are having a fascinating discussion here on export diversification. The charts below have been uploaded to help that discussion. Any comments should be put on that blog post to eliminate duplicitity. .......In the previous article, we showed that due to serious conflicts of interests in the FRA board composition, price manipulation and monopolistic tendencies, or collusion cannot be prevented by that body. Without going too deeply into the ineffectiveness of the FRA, the worrying clouds over the national economy are not receiving the attention these clouds deserve. and Industry, the minister of Finance and the governor of the Bank of Zambia (BoZ). Let us see what they have been doing and should be doing to assure us Zambians that the national economy is being looked after in our interest which is to say, shortages, exorbitant prices, inflation, exchange rates, jobs and prosperity are all under constant review to ensure stability. In short whether it is the FRA, Zesco, water and sanitation service company, bread, meal and flour prices and so on, the ministry through the ZCC, Zambia Bureau of Standards and its licensing powers should and can ensure availability of goods and services at fair prices regularly. It may need to discuss with or bring to the attention of other ministries and bodies but it should not be a by-stander. The development of vertical integration (Zesco and Zambia Sugar for instance) should not be allowed to continue to distort the economic balance as they behave exactly in a manner which is against the national interest. Some questions: how much stock is carried to prevent panic buying or price manipulation for such items as petroleum, maize, wheat, rice, beans and so on? How many months would the stocks last at normal consumption without pushing the prices up? Which division in the ministry supervises this activity —monitoring and regulating? The levels of these stocks should be subjected to regular review by Cabinet or a Cabinet committee. Although the ministries of Agriculture, Energy and water are production units, it is commerce, trade and industry which should be greatly involved in preventing what is happening in other countries: protests by farmers and consumers, go slows by truck drivers, unaffordable prices of basic food stuffs, manipulation of prices and warning others in Government against activities or decisions which endanger stability and availability of goods at fair prices in the nation. A previous blog provided some information on the extent of income inequality, but as Central Statistical Office (CSO) noted last week , at the heart of this divide is unequal access to infrastructure. The chart below illustrates the rural urban divude in access to facilities / infrastructure. The government of Zimbabwe recently ordered foreign aid groups to halt their operations within its borders, thereby blocking the food aid that the United Nations funnels through such organizations from getting to the country's starving people. Last month, the government of Burma issued a similar ban. Of course, when we say "the government of Zimbabwe," what we really mean is President Robert Mugabe, just as "the government of Burma" these days means Senior Gen. Than Shwe, the leader of the ruling junta. In justifying the bans, each ruler harrumphed that outsiders should not be allowed to tell his nation what to do. But the real obstacle blocking international food aid is not the principle of national sovereignty; it is the insistence of dictators on being left to call their own shots. Mugabe decided that his citizens were better dead than fed; his nation had no part in the decision. This murderous outrage reminds us of a central problem in trying to help ease the misery of the developing world, especially the "bottom billion" inhabitants of countries being left behind by global prosperity: Leaders in such sad little states as Zimbabwe and Burma are quite ridiculously powerful. They have turned parliament, the news media and the judiciary into mere implementers of their strangling systems of control. But the extraordinary lack of external restraints on these dictators is poorly understood. Many people are still trapped in a politically correct mindset that sees a strong rich world bullying a weak poor world. The disastrous U.S. invasion of Iraq in 2003 played straight into this mentality of seeing wealthy countries as bullies. Yet the planet's key power imbalance is not between rich and poor; it is between confident, open governments willing to pool sovereignty to help their publics and crabbed, defensive governments determined not to give up a scrap of sovereignty. The former produce prosperity; the latter manufacture misery. Compare the powers of Germany's government to those of Zimbabwe's. The German economy is around 400 times larger than the Zimbabwean. But it is the Zimbabwean government, not the German, that has independent monetary, fiscal, trade and migration policies, an independent currency and courts from which one cannot file international appeals. Like virtually all rich countries, Germany has learned that there are real advantages to limiting its own sovereignty and pooling it with neighbors and allies. But the governments of failing states such as Zimbabwe and Burma have refused to share any sovereignty with anyone. And remember, in these countries, "government" means the president or other head of state: Mugabe and Shwe have powers that eclipse those of President Bush, let alone those of German Chancellor Angela Merkel. So how can the grossly excessive powers of the Mugabes and Shwes of the world be curtailed? After Iraq, there is no international appetite for using the threat of military force to pressure thugs. But only military pressure is likely to be effective; tyrants can almost always shield themselves from economic sanctions. So there is only one credible counter to dictatorial power: the country's own army. Realistically, Mugabe and Shwe can be toppled only by a military coup. Of course, they are fully aware of this danger, and thus have appointed their cronies as generals and kept a watchful eye on any potentially restless junior officers. Such tactics reduce the risk of a coup, but they cannot eliminate it: On average, there have been two successful coups per year in the developing world in recent decades. A truly bad government in a developing country is more likely to be replaced by a coup than by an election: Mugabe will presumably rig the runoff vote scheduled for Friday by intimidation. Or he could follow the example of the last Burmese dictator, who held an election, lost and simply ignored the result. I find it a little awkward to be writing in praise, however faint, of coups. They are unguided missiles, as likely to topple a democracy as a dictatorship. But there is still something to be said for them. Since the fall of the Soviet Union, the international community has taken the rather simplistic position that armies should stay out of politics. That view is understandable but premature. Rather than trying to freeze coups out of the international system, we should try to provide them with a guidance system. In contexts such as Zimbabwe and Burma, coups should be encouraged because they are likely to lead to improved governance. (It's hard to imagine things getting much worse). The question then becomes how to provide encouragement for some potentially helpful coups while staying within the bounds of proper international conduct. In fact, some basic principles are not that hard to draw. For starters, governments that have crossed the red line of banning U.N. food aid -- a ghastly breach of any basic contract between the governors and the governed -- should temporarily lose international recognition of their legitimacy. Ideally, such moves should come from the United Nations itself; surely banning U.N. help constitutes a breach of rudimentary global obligations. But realistically, other dictators, worried that they might wind up in the same boat, would rally to block action at the United Nations, so we must look elsewhere. Which brings us to the obvious locus of international action: Europe. The European Union has a long tradition of setting minimum standards of political decency for its members, who must protect their minorities and defend basic rights. A collective E.U. withdrawal of recognition from the Mugabe or Shwe regimes would be an obvious and modest extension of the values that underpin the European project. Making any such suspension of recognition temporary -- say, for three months -- would present potential coup plotters within an army with a brief window of legitimacy. They would know that it was now or never, which could spur them to act. And even if the loss of recognition did not induce a quick coup, E.U. recognition would be restored after the three months were up. This would spare the world the gradual accumulation of a club of unrecognized regimes, something both problematic and unrealistic. The scope of the torment in Burma and Zimbabwe should be more than enough of a goad to action. We need to move away from impotent political protest, but we must also face the severe limitations on our own power. The real might lies with a dictator's own forces of repression. Our best hope -- and the best hope of suffering citizens -- is to turn those very forces against the men they now protect. Disappointed to see Paul abandone restraint in his writing. I can see the case for military intervention in a post Mugabe Zimbabwe to "guarantee peace" - in the same way the British intervened in Sierra Leone, they could do the same thing in post Mugabe Zimbabwe just to smooth things over and ensure whoever is in charge can take forward policies on a more secure platform. But to suggest a "western led" coup to eliminate Mugabe is just irresponsible and shows a lack of appreaciation of the complex issues that have brought Zimbabwe to this current situation and indeed the power dynamics at play within the country. Paul is also wrong on two key points. First, the suggestion that things cannot get worse in Zimbabwe with explicit military control is misguided. The idea that Zimbabwe is somehow at the bottom list of failed states that Africa has ever witnessed is incorrect. Zimbabwe is a failed state yes, but some of its apparatus is still functioning. Secondly, the incentives for an explicit military move to topple Mugabe appear weak. Paul would do well to ask why they have not done so already in the way he has suggested. I suggest that not only are the military generals hands themselves full of blood (making them ideal candidates for war crimes tribunal), but also that they prefer to hide behind a human face while controlling things on the ground. I decidedly suggest that reciprocity should be abandoned. If other countries want representation in Zambia, that should be their business. We have a limited pot of funds and should be driven by economic imperatives. In the meantime, the President has acknowledged that many embassies are not managing the tax payers money properly. Which raises further questions on the very wisdom of having additional embassies. It appears that the issue of dual citizenship is taking centre stage in the current constitution making process with erstwhile army commander and Vice President Christon Tembo and Immigration Department Chief Ndiyoyi Mutiti expressing security concerns if the provision is included in the new constitution. One would understand the background Lieutenant-General Christon Tembo is coming from as head of the Zambia Army at the height of not only the one party state but at the time when Zambia faced apartheid South Africa as an enemy. At that time, the country housed freedom fighters whom it had to protect by any means as they risked being smoked out, if that is the phrase, by the white South African soldiers. Politically, the African continent was very unstable then with coups and counter coups being the norm and as a result undemocratic leaders of the time shut out of power not only citizens within the country but more importantly the “enemy” was seen to be one with foreign connections. The government at the time thought that denying people dual citizenship was the solution. Unfortunately, it is this mindset that has been carried forward when the political state in Zambia in particular and Africa in general, has changed. In the case of Mutiti, her fear for someone with dual citizenship committing a crime in one country and running away to another just shows “thought ossification” in the Zambian civil service. She should know about Interpol which does a great job of tracking criminals around the world. Ms Mutiti should suggest to government to sign extradition treaties with countries where there would be a prevalence of dual citizenship for ease of tracking down criminals who would try to hide in other countries. It appears General Tembo, Ms Mutiti and other politicians and civil servants do not understand the concept of globalisation even as they use it at public forums. The World Bank describes globalisation as an inevitable phenomenon in human history that has been bringing the world closer through the exchange of goods and products, information, knowledge and culture. “But over the last few decades, the pace of this global integration has become much faster and dramatic because of unprecedented advancement in technology, communications, science, transport and industry,” the World Bank states on one of its websites. With the advancement of information and communication technologies (ICTs), some of the things an old soldier of General Tembo’s mould would hold dear, like the personnel and material capacity of his army, can easily be found with the click of the button on a computer. A simple search on Google Earth would easily give one the coordinates of sensitive infrastructure of a country. As such, General Tembo’s fears become not only unfounded, but unreasonable. Globalisation, ICTs and Google Earth aside, one wonders how developed countries which otherwise would have a lot to lose by allowing dual citizenship, sensibly grant dual citizenship while poorer countries always think about security and crime as a way of denying those wishing to acquire dual citizenship. In most cases, there is a genuine reason for one wanting dual citizenship rather than the thought of committing a crime in one country and running off to another. Like others have argued, there are children of Zambians born outside the country who only know Zambia in name but have more in common with the country of their birth. These children, for atavistic reasons, want to hold on to the citizenship of their parents while also enjoying the citizenship of their countries of birth. NCC members debating the issue of dual citizenship should not be swayed by “has been” politicians and civil servants whose understanding of globalisation and ICTs is minimal and have unfounded fear as to why this should not be included in the constitution. What the NCC members should bear in mind is that Zambia stands to gain once dual citizenship is allowed because such citizens will easily be moving resources between countries. Malawi desperately needs to pass the budget and, frankly, if there is no budget you can't get budget support and much of the donor assistance coming to Malawi comes as direct budget support," Michael Keating told Reuters in an interview on Monday. The opposition alliance of United Democratic Front (UDF) and Malawi Congress Party want with President Bingu wa Mutharika's breakaway Democratic Progressive Party (DPP) to be resolved before the first passage of the budget. The opposition parties say that according to the constitution wa Mutharika's party should lose 60 legislators he is accused of poaching when he quit the UDF. The impoverished southern African nation relies heavily on donor money for its public spending and had expected to receive some 90 billion kwacha in assistance in the 2008/09 financial year, a 36 percent increase from last year. In Lusaka, Zambia’s dilapidated capital, I stop by the office of David Ndopu, who has closely followed the Donegal case. Faced with the aggressive pursuit and seizure of its assets, the Zambian government transferred $15 million—1 percent of its annual budget—to Donegal from a British bank account in October. “It was very painful,” Ndopu says. But it is hard to see how Zambia’s increased financial burden is going to make things worse for the average Zambian. Musonda Kapena, who runs a humanitarian-aid agency in the countryside north of Lusaka, tells me that so little money is reaching rural Zambia—where most of the population lives—that $15 million more would hardly make a difference. In August 2006, as schools were desperately trying to obtain a few more pieces of chalk for their blackboards, Zambia paid $7 million for its president, Levy Mwanawasa (who is still in power), to lease an Italian-­made twin-turbine AB-139 Agusta helicopter. For the alternative on the same issue, check out Defending the Vulture Funds. The new fiscal regime for mining increases the average effective tax rate from a level that was significantly below that in other mining countries. When the international price of copper is at around the historical average, the windfall tax will not apply, and the average effective tax rate would be comparable to that in other countries. When the price of copper is well above the historical average, specifically, above $2.50 per pound, the windfall tax will come into effect and rise progressively with the price of copper. Staff cautioned that while progressivity is desirable, the marginal effective tax rate is very high at very high prices. Staff noted that it could be lowered by making the windfall tax, like royalties, deductible for the purpose of calculating taxable profits. Staff further suggested that, instead of the price-based windfall tax, a more appropriate way of capturing a larger share of the rents when prices are abnormally high would be through a progressive profit-based variable tax that would take into consideration the different cost structures across mines. The authorities argued, however, that they consider the windfall tax a more effective way to capture a sizable share of the rent when prices are exceptionally high and that current income tax provisions do not allow taxpayers to deduct other tax payments. I have a lot of problems with the policy to grant car loans to chiefs in a context where the role of chiefs in Zambia’s governance system is ill-defined. Are chiefs public officers accountable to the Minister of Local Government and Housing or traditional representatives of their people at the local level? How much are chiefs paid to be able to service a car loan in excess of K80 million? It is common knowledge that chiefs’ allowances are so meagre that they are not even able to survive on them. One only needs to visit some chiefs’ palaces across the country to appreciate the fact. some of them live in destitution and their palaces are in states of disrepair. However, those known to have been supportive of the ruling party have benefited greatly from the government’s largesse. Some chiefs still remember how former president Frederick Titus Chiluba showered them with ‘presents’ and feted them in prestigious hotels in the capital, especially at the height of the third term campaign. In 2006, some chiefs complained that they had not received as much financial rewards from the current incumbent of State House compared to his predecessor. It is clear to me that the relationship between the government and chiefs is not based on a coherent policy. Chiefs have come to be considered as an important tool for the mobilisation of the people, especially during elections. Their integration into the policy formulation and implementation process has been minimal. For example, a closer examination of the Decentralisation Policy does not provide for a visible role of chiefs in local governance and development. research has revealed that chiefs would like to play an important role in supervising development programmes in their chiefdoms, but feel that they have been largely marginalised by the government and governmental agencies. Why has public policy not formally incorporated chiefs in policy formulation and implementation? Why are chiefs only considered important for purposes of mobilising the vote? What is the public attitude towards chiefs’ role in local governance? Is the present structure of chieftaincy, whereby chiefs ascend to the throne by appointment and not election consistent to a democratic political order? These may be uncomfortable questions but require honest answers, if the role of chiefs in Zambia is to be meaningful. There is no unanimity as to the extent to which chiefs should be integrated into the modern political system. ....As our delegates deliberate the new constitution, it is important that the role of chiefs in our governance is clearly defined. To pay chiefs salaries and even give them car loans when they are not public officers is difficult to fathom. We have to reach a consensus as to what role chiefs can play in the local governance system and how the institution of chieftancy can be adapted to a modern democratic dispensation. During the colonial period, chiefs were an extension of the colonial administrative apparatus and had defined functions. If chiefs have to be paid from the public treasury and even access benefits such as car loans, they are public officers and it is important that they become integrated into our local government system. The current Decentralisation Implementation Plan (DIP) should address itself to evolving a more meaningful role for chiefs in local governance. But PARPA's second phase - launched in 2006 - is the pursuit of a "green revolution", designed to open up the country's 128 districts to the rewards of commercial agriculture through the provision of transport, communications infrastructures and financial services in the rural central and northern provinces. About 80 percent of the country's 21 million people are engaged in small-scale farming. The government is also revising its approach to extractive industries to ensure that future mega-projects, like Mozal, generate more revenue for the poor. New tax regulations, such as 10 percent on oil, six percent on natural gas, 10 percent on other mining products, would also see mining concerns paying a tax on a mine's surface area. Deputy Minister of Mineral Resources, Abdul Razak, said earlier this year the 2007 laws had made it obligatory to publish fiscal revenue from petroleum operations, and ensure that part of the tax revenue from mining and petroleum operations would be used for the local community's benefit. A debate is raging in Zambia and the diaspora on Dual Citizenship. As you know Zambians abroad cannot take part in the current National Constitution Conference and are not even recognised by the National Constitutition Conference Act 2007. However, we can all voice our opinion and hopefully help shape the debate on this issue from the sidelines. In the next couple of days, I'll highlight the various pieces that has been written, and still being written, on the proposal for dual citizenship. In the mean time do familiarise yourself with the Mung'omba Draft Constitution . All blogs relating to "dual citizenship" would be found under the "diaspora" tag clouds - lengthy and coherent contributions may be turned into "guest blogs" to aid the discussion on this important issue. Sad developments in the case of Ian Manning, who maintains several Zambian blogs and has contributed several times in discussions on this blog (e.g. here , here and here). Not sure whether the issue surrounding the deportation and the apparent whisking away from Zambia, is related to this case. No doubt as and when Ian is able to blog, we shall hear more on this. Many thanks to the anonymous reader who provided the following update on Ian and giving us further information on the Ian's continued struggle for conservation and against the corruption of ZAWA et al. Ian called in from Joburg in the early hrs of Monday, dazed and exhausted and having been put out unceremoniously by the Zambian officials at the border at Martins drift, broke, cell phone confiscated, he eventually found a seat on a minibus full of Zimbabwean refugees back from a funeral in Plumtree. He's ok and now that he knows about the granting of his injuction on Friday night(making his risky and traumatic journey pointless), he is itching to get back and fight for his business, Landsafe project and his dignity. Ali my sister, has just smsed to say permission has been granted for the lion breeding scheme in Livingstone something Ian has led the battle against, only recently relieved by growing public support from the residents of Livingstone. I wonder if this caused the thug element hiding under Levy Mwanawasa's good name, to rush a decision on Ian when the immigration game has been going on for almost two years and has cost Mbeza a fortune for temp permits ( at $1500/month) not to mention the collapse of the hunting company through all the damaging publicity. Or perhaps the guys who have just been awarded his confiscated hunting area are worried he will follow them all the way to the supreme court, or then again the bunch of non-cowboys whom Ian exposed illegally privatizing a the Mwape forest reserve or indeed the Legacy gang annoyed about their two Ha in Livingstone instead of the 200 they had bribed ZAWA $9 mil for. The list of crookedness Ian has tried to straighten out would make John Wayne look like the tea boy, a good record of his engagement can and should be found on his blogs starting with victoriafallsheritage. I am ashamed of how little I have helped him in his relentless quest for justice and fair-play for voiceless people, wildlife, habitat and the law, so I only hope other colleages who distanced themselves from Ian feel a lot worse and make some sort of united moral stand and straighten up the tourism industry before Zambia looses everything of value to the greedy thieves. There are as Ian has pointed out many times enough laws to protect it, just a matter of if we insist on upholding these laws. IRIN are suggesting that Zambia is the most likely destination for post election Zimbabwean refugees. I suspect Botswana will take further hit. But its quite clear that the Zambian government are conscious of the vast economic implications this might have. Its also quite interesting that the most pro-Mugabe governments are further away from Zimbabwe with zero prospect for Zimbabwe refugees (e.g. Angola, DRC, Malawi). Are we right to say their support for Mugabe may well be at our expense? The government is conscious of the gravity of the current shortage of electric power and the risk it poses to sustained growth. Development of the electricity sector is vital to achieving sustained high growth and reducing poverty. In particular, greater electricity generation will be needed to support the envisaged expansion of mining, private sector growth, and the planned rural electrification program. There is a need to strengthen policies to ensure that sufficient electricity generation capacity is installed as quickly as possible to meet a rapidly growing demand. To this end, the government will develop policies with specific strategies to (i) gradually adjust electricity tariffs to reflect the cost of service; (ii) attract private investments and competition in the sector; (iii) increase the operational efficiency of ZESCO and strengthen its governance; and (iv) ensure that ZESCO has sufficient resources to implement the planned rehabilitation and new generation projects. Given the urgency, the government intends to complete this action plan no later than June 2008 (structural performance criterion). Further, as a first step to improve the financial footing of ZESCO, the government will ensure that all arrears to ZESCO from ministries, provinces, and spending agencies (MPSAs) are paid by end-December 2008. Moreover, the MoFNP will issue a circular instructing all ministries, provinces, and spending agencies (MPSAs) that (i) all utility bills for each quarter are to be paid from the quarterly budget funding and (ii) all funds released for payment of utility bills should not be reallocated by MPSAs. As I have said in previous blogs, many of these companies really only underperform due to the large debts owed to them. Its good that common sense is largely prevailing. But a note of caution – these temporary moves suffer from serious commitment issues. Even if the current government pays off these debts, whats to stop the next government accumulating similar debts? We need to take away the reason for accumulating these debts and that calls for elimination of the government “capture” of ZESCO. The same applies to ZAMTEL and parastatals suffering from this problem. "In Zambia 53% of every dollar spent on cellular services goes into government coffers.."
Not sure how valid this claim is, but you can read more on Zedian's blog. Minster for Trade and Commerce Felix Mutati combining flawed logic with incorrect statistics. One can certainly think of better measures than comparing volumes e.g. total remittance share of GDP , remittance per head, remittance per migrant, etc. In any case he seems to be using strange numbers. That aside, higher remittance is not always a good sign - just ask the Zimbabweans. Previous blog discussions / data on remittances can be found at the diaspora label. A new fiscal regime for the mining sector came into effect on April 1, 2008. The new regime will ensure that the government receives a greater share of mining profits and rents, through the introduction of a windfall tax and a variable profit tax, as well as an increase in the mineral royalty. In implementing the new fiscal regime, the government will be mindful of the need to preserve Zambia’s attractiveness for investment in mining. To this end, the windfall tax and the variable profit tax will not apply at the same time. When the windfall tax applies the profit tax rate will be the standard 30 percent. With international copper prices projected to decline by about 12 percent in 2008, mining revenue is estimated at 2.8 percent of GDP in 2008, about 1.4 percent of GDP higher than estimated under the old fiscal regime. In 2008, all mining revenue in excess of what would have been collected under the old regime K 722 billion will be saved in a separate government Mining Resource Account (MRA) account at the Bank of Zambia (BoZ). The MRA will be used as a stabilization fund to smoothen expenditures over time taking into account macroeconomic conditions and absorptive capacity. In 2009 and subsequent years, the net inflow to the MRA will be based on the medium-term expenditure framework (MTEF). The funds would be used to finance high priority projects identified in the FNDP. All revenues, including those channelled through the MRA, and expenditures will be fully integrated in the budget and fiscal accounts. National Constitutional Conference (NCC) vice-chairperson Faustina Sinyangwe Faustina bemoaning the lack of public interest in the ongoing National Constitutional Conference (NCC) sittings. The ignorance of some politicians is truly baffling. Of course the people regard this as a lower priority compared to other things. They have no luxury to sit down for a whole day and "debate" issues. Ms Sinyangwe forgets that while she sits there being paid $350 a day just for talking and reading, 70% of our people are living on a hard earned $1 a day. Incidentally, if she's so concerned about people participation in general, she would have had the sense by now to atleast create a website so that the public have accessible information and can contribute through other means. Crucially, Zambians in the diaspora would also have an opportunity to engage in the discussions. But on a serious point, I think the lack of people participation raises profound questions on whether this constitution will provide the necessary political institutions that will alter the balance of power from few rich urbanite folks who have held Zambia in a grip since independence towards the poor and the voiceless. The truth is that Zambia moved from a One Party State towards a multi-party system that has effectively remained a defacto One Party state. Yes, Zambia's political system on paper is a "multi-party" but the distribution of power within our nation remains very much a one party state. To make matters worse, we are still recycling the same leaders from the past that have often failed us. We have an elite of Zambians that continue to shape our destiny for better or for worse. Angola is growing at fast pace with a staggering 30% growth predicted this year, but early hopes of a liberal democracy remain a distant dream. It appears as the country develops faster off the back of increased oil production and rising commodity prices, the stakes for control of its future are get higher, and in the background lies rising dragon from the east. The scheduled September 5th elections may reinforce that point. Now we venture into uncharted waters. I have been thinking about Kachasu related issues of late. Kachasu (or lituka) is a traditional Zambian brew that is drunk in many rural parts of Zambia and in poor urban townships. My reflections have been prompted by a combination of two recent wonderful articles in the Times of Zambia and a recent download of a classic Zambian song by the Five Revolutions called 'Kachasu', which brought floods of memories of my early childhood in Nchelenge and Mwansabombwe. Kachasu's alcoholic content can vary significantly, depending on the strength of the brew. 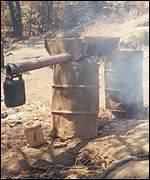 A research on the composition and safety of kachasu conducted in 2001 by by University of Zambia (UNZA) academics, found that Kachasu contained about 20 to 30% ethanol - pure alcohol. They discovered that the beer contains no major contaminants but added that basic hygiene was crucial. The researchers also noted that if flavoured with fruits, it could be made less potent. Other studies have found the strength can be as high as 70%. The limit to Kachasu's strength appears to depend on the strength of people who drink it. Simply put, Kachasu is a low skill labour intensive product. In a country with massive unemployment and poor education standards, especially among women, it fits the bill of would be rural or urban township entrepreneurs. As Ms Mbewe explain to Trevor, 'I have nothing else to survive on, I look after my three children out of this business'. On the demand side, the low price for the product seems to generate ulimited demand, as typified by the response from Trevor's "easterner" : “My brother, let no man cheat you. This is a beer that once you discover, you can never wish to stop. It’s so nice, I have even stopped taking bottled beers because one, I don’t get drunk on them any more, and two I spend a lot of money on them. But not for this beer,” . This is when it becomes a little complicated because selling Kachasu is of course illegal in many certain Zambian towns with Kachasu bye-laws in place. There is no national law preventing home based consumption, though government has previously campaigned hard for avoidance. Indeed the Five Revolutions' Kachasu song was largely driven by the government propaganda to sway people away from drinking it. During One Party state it was common for the government to get bands to do songs that accorded with the government position at the time. That said, the main point is that Kachasu remains legal to drink, what is forbidden is the commercialisation of Kachasu and that appears to depend on local enforcement of bye-laws. What are we to make of all this? We can drink ourselves to death or financial ruin or marital breakdown as long as it is at home (parallels to the smoking ban clearly don't fit, since smoking remains a commercial activity, though its public consumption is somewhat restricted). After careful reflection on this issue, I have come to the conclusion that the bye laws sole focus on preventing commercialisation of Kachasu is misguided for a number of reasons. Kachasu may cause health related issues, with wider repercussions for society. For example, it might lead to lost output through causing death or illness, which might even put more pressure on public services (on the flip side, death might reduce long term dependency on the state). As i have noted above, the UNZA research found that there was no significant contaminants in Kachasu, and crucially no adult has yet died from taking Kachasu directly. Any health issues appear linked to hygiene and those probably go beyond the Kachasu industry. This is crucial because in the past, there has been some unfounded allegations that some kachasu brewers add battery acid or fertiliser to give the drink its bite. We find these allegations not just with Kachasu but with other local brews like Chibuku. But even if such problems existed, that does not necessarily mean that government must ban Kachasu. We first need to understand the scale of the problem, assuming such problems exist, specifically what the social cost on society is that is not borne by the drinker (this would require measuring the cost quantitatively, with some precision). Then we need to provide a positive rationale for tackling the problem. The government really has many other 'market failures' besides Kachasu which they could equally address, but for lack of time or effort or lobbying they don't. We need a positive reason why the Kachasu issue is more important than others (beyond being politically more feasible), since we can't tackle everything (a positive argument could be based on the need to expanding freedoms - more on this later, if time and space allows). Finally, we need a policy instrument that fully addresses the scale of the problem and fulfills the positive rationale without difficulties. For example, we might reasonably argue that even if Kachasu is a problem, a ban may be inappropriate because if health related issues are the failure, we simply need to make sure the Kachasu drinkers pay for the cost in some way. But even before that we face question on why other drinks like Scottish gin or Chibuku aren't treated as failures of the market - an answer might be that they are taxed! If so, why not then simply formalise Kachasu and tax it? Without going into too much deeper discussion, it becomes immediatelty clear that its a complicated issue. Kachasu may cause civil disobedience, crime and family breakdown. On the surface this seems the more straightforward to accept. My old neighbour in Nchelenge was a serious Kachasu drinker. Nearly always you would hear him from afar late in the night making noise. But for every noise Kachasu drinker theres a quiet one! I do not think that Kachasu drinkers are any noisier or lead to more family break down than other types of alcoholics! Just ask European football fans who after drinking tonnes of bottled beers suddenly turn into serious football hooligans. In any case even if Kachasu has a deeper psychological and physiological effect that generate propensity towards civil disobedience and family breakdown, one is still left with the inevitable question of whether other interventions would be better rather than hurting the private and social benefits it might bring. The key point here of course is that as well as trying to resolve the "market failures" of civil disobedience and so forth, we also need to recognise that sometimes the other danger is "government failure". Many are the troubles that well intentioned policies bring. 'Kantolomba has the highest number of TB, STDs, and HIV cases in Ndola district. 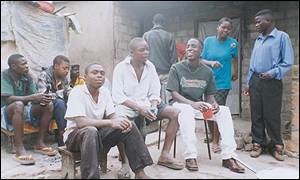 This is due to the fact that the township acts as a manufacturer of Kachasu, the illicit beer. A lot of men and women, including youth idle around taverns and sink their lips into cups of chibuku too''. “When people drink Kachasu, especially in rural areas, they become completely unproductive. Government should do something about this situation so that discipline can be restored in our country" . The truth of course is that there's no evidence that Kachasu causes poverty. All we know is that the poor and the most traditional of Zambians like Kachasu or go together (correlate). Proving that something causes another thing is actually quite difficult. But even if it were the cause of poverty, as I have explained above, it would not matter as long those negative costs are known and are fully reflected in the prices people pay for Kachasu. The watch phrase of course is "economic efficiency grounds". There might of course be other reasons on "equity or fairness grounds", why it would matter that Kachasu causes poverty (assuming it does indeed cause poverty). If say Kachasu resulted in some form of spatial inequality i.e. it lead to poor areas getting pooerer due to Kachasu drinking and richer areas getting richer due to Kachasu avoidance. In so far as society may prefer a more equitable society, and inequality may lead to other "unpriced" negative effects in the long term (i.e. beyond the direct ones we have discussed), the government might want to intervene to reverse these inequalities. The key here of course is for government to demonstrate that Kachasu leads to poverty and then to wider gaps between urban areas ('urban inequality) amd between regions (regional inequality). As I have said, this is of course a tall order. For one thing, establishing causality is an extremely daunting task. The closest we come to doing that is through random controlled trials (RCT), but even those rely on plenty of assumptions (e.g. excludes general equilibrium effects). In a Kachasu RCT, we would randomly assign people to two different groups and treat one group with a lot of Kachasu and see whether the treated group is any poorer overtime, all things being equal. All of this is tricky of course and in any case no one has ever done the Kachasu RCT. My guess is that the individual drive for Kachasu is driven by their taste buds, availability of alternatives beers and of course their level of income. I suspect Kachasu is actually a good one demands less of as they have more income. So you could even argue that if we really want people to avoid Kachasu just put more money in their pockets! But I have no empirical basis for this, and some articles have shown that people of all walks of life like Kachasu. (see Potifer Tembo's Illicit Kachasu beer, has it got a positive side?). The other problem I have with the current bye-laws is that they appear to limit the eonomic freedoms of the poor, possibly in favour of greater freedoms for the rich. As we've established, the labour intensive nature of the brew lends itself well to the low skills of the poor. By preventing the poor from engaging in full commercialisation, it alters the incentives in favour of bottled beer drunk mostly by the rich. If economic freedom for the poor, is a measure of their development (in Sen sort of way), then any thing that restricts their choice clearly impacts negatively on them (whether this is bad from society's perspective depends on whether this is a zero sum game i.e. a win for the rich sees equal losses for the poor - that may not always be true in practice). At the end of the day the poor will always spend money on alcohol, the question is which type of alcohol and in what proportion. Unless there's a clear and compelling reason for a full ban, a partial anti-commercial ban must be viewed as discriminatory against the Kachasu industry in favour of the bottled industry, and against the poor in favour of the rich (who also have an array of drinking choices). But its not just the issue of dicrimination, there's also the wider point that the opportunity cost of the current Kachasu bye-laws for Zambia appears to be significant. Kachasu brewing can be turned into a viable industry that is properly regulated and generates tax for government (money that could be used to handle any side effects, if any). That this industry has been prevented from emerging is there unfortunate. If we accept the analysis presented above, it is quite clear that government through the bye-laws has blacklisted of a good beer product which has the potential to be exported, earning the country much needed foreign exchange. Many have noted that it is actually sad that the government has allowed a Malawi- made spirit called "Number One" that is just as strong as kachasu being imported into Zambia. The 'Number One' spirit is brewed by local people in Malawi just like Zambian villagers who are being funded by their government in co-operatives, this beer is then brought to Zambia. See Potifer Tembo's piece reference above for on thse missed opportunities. A final point is that common sense suggests that society, and crucially politicians, do not believe Kachasu is harmful. This local brew is drunk at many traditional ceremonies from the Mutomboko to the Kuomboka to the Ila festivals. Nearly all of these festivals are attended by politicians including the President. But its actually much worse than that. A recent Post Editorial noted that Zambian politicians often use beer (including Kachasu) to woo voters. While that particular Editorial rightly raises concerns of the negative effects of alcohol, the general call is for a principled approach to the problem and need for better regulation, rather than the current approach for politicians of applying double standards. Of course formalising the Kachasu industry may carry some costs. Those costs should not be ignored and as we have argued the correct response is to reflect as much as we can in Kachasu prices. But whether you support formalisation or not the challenge for government is to carefully weigh these trades-offs and put a case to the people on why the Kachasu industry should remain informal or indeed why the ban should be extended to prevent consumption at home. Crucially government needs to also evaluate the opportunity cost of the current bye-laws. My current inclination is that the pros of lifting bye-laws and formalising the industry outweigh the costs. I would be interested to hear from others on this issues, especially on my intepretation of the current legal framework.